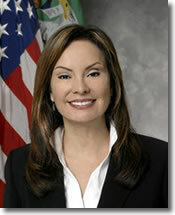 Rosie Rios, the 43rd Treasurer of the United States, resigned from her position effective on Friday, July 8, 2016. She first assumed the office back on August 6, 2009. As Treasurer, Rios oversaw the Bureau of Engraving and Printing, the United States Mint, and was a key liaison with the Federal Reserve. She was also a senior advisor to the Secretary of the Treasury and strongly promoted the concept of a woman appearing on U.S. currency. "I am particularly grateful for her creativity and leadership in the effort to redesign our paper currency and to ensure that future notes reflect, for the first time in 120 years, the important role of women in shaping our democracy, Politico quoted Jack Lew, the U.S. Secretary of Treasury. "I thank her for her service and wish her all the best in her future endeavors." Rosa "Rosie" Gumataotao Rios was nominated to fill the post by President Obama in May 2009. The U.S. Senate unanimously confirmed her appointment in July 2009. Rios attended Harvard University where she graduated with high honors before moving into real estate finance. She then turned to the public sector, overseeing economic development in different cities including Oakland, California. From there, she became a principal partner at the consulting firm of Red River Associates. Prior to her appointment, Rios was the managing director of investments for MacFarlane Partners, a real estate management firm based in San Francisco. She worked in Virginia to help solidify the Latino vote during President Obama’s first presidential campaign, leading to her placement on the Treasury-Federal Reserve transition team. As Treasurer, Rios was well known for attending many coin shows. For those asking, Rios would sign her autograph below her facsimile signature on notes. Federal Reserve notes will change with her departure. A suffix letter is often added to the series issue to acknowledge a treasurer replacement. Notes will also feature a new signature when the 44th Treasurer is appointed. Suffix letter is the way they used to do it, but for no apparent reason erratically the dates are changed too. (That used to be only for major design revisions.) It will be interesting to see how this works out, or even if a new person is appointed before the next Administration. If not they will continue the same signature. If someone steps in it will briefly change, not that this likely to matter much. People got excited when Barr was in office for just a few weeks at the end of the Johnson era, but so many notes were printed that they have never been scarce. Ok. So that means things are going to be better. NOT!! It would be nice but things don’t change just because they change one person. They would have to do a major over haul in every department from the bottom all the way to the top. Rosie Rios as US Treasurer for 7 years attended more coin & paper money shows than any of her predecessors, giving thousands of her “courtesy signatures” on banknotes for collectors. Thanks for your service Ms. Rios! And here I was complaining to Treasury Secretary Lew about the mint but maybe it should have been Rios instead. Or not – as Treasurer she probably was only concerned that the volume of pennies (and the other usual coins) met the demand from the banks rather than anything having to do with collector coins or coin collectors. BTW I sent a letter to Lew complaining about the mint management and all he did was forward it to the mint who then responded saying this is the way we do things or in other words tough beans. You might want to read my posted comment today under the BEP note production article on this website.